Inshore water temperatures on the North End of the Grand Strand are around 80 degrees, and water clarity is pretty good for now. 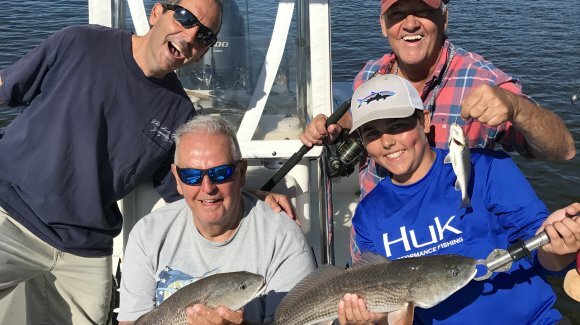 The heat of summer has arrived in the Little River/ North Myrtle Beach area, and Captain Patrick “Smiley” Kelly (843-361-7445) reports that as a result fishing is a little bit of a roller coaster right now. 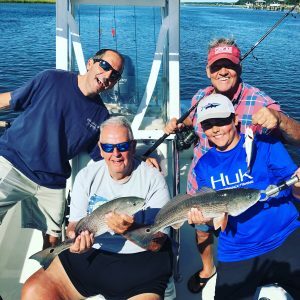 On days like today his boat had caught more than a dozen trout to go with redfish and bluefish by 9 a.m., but on other days the fishing is slower and they only catch a few fish. Overall the trout bite continues to be about the best thing going, and early in the morning they are catching fish on topwater lures like Mirrolure Top Pups and Zara Spooks before switching over to live shrimp underneath a popping cork. Today they caught a 4-pounder on shrimp. Redfish are eating Gulp! jerkshad and shrimp, and they are also picking up reds dead sticking baits around docks. In the Calabash River there are giant schools of pogies, and fishing these baits on the bottom around Tubbs Inlet, Tillman’s Dock and Bonaparte Creek is letting anglers tangle with some big drum. The black drum bite has slowed down in the summer heat, but they are still catching a decent number of short flounder as a by-catch. Overall it’s been a down year for flounder, however.